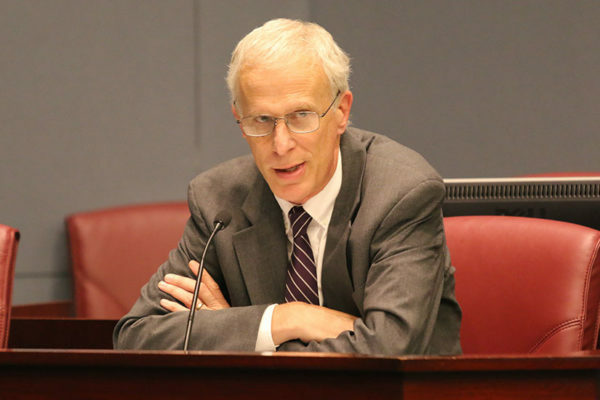 County Manager Mark Schwartz is calling for a “hiring slowdown” for Arlington’s government, choosing to leave dozens of positions vacant while county officials mull how to cope with a yawning budget deficit. Schwartz told the County Board last Tuesday (Nov. 27) that he isn’t planning a full hiring freeze for the county workforce, but he will nonetheless direct 10 department heads to hold off on hiring across 45 different positions for the foreseeable future. The county’s budget picture for fiscal year 2020 is still coming into focus, but Schwartz projects that the county and its school system could combine to face a $78 million budget gap next year. That means that some mix of tax increases, staff layoffs and program cuts are likely in the offing, after the Board declined to raise taxes this year, and Schwartz is working to get ahead of some of those unpleasant measures with this slowdown. Schwartz said that the positions left unfilled include roles like librarians, code enforcement and housing inspectors and cultural affairs staffers with Arlington Economic Development. He added that the county generally has roughly 200 positions left unfilled at any given time, out of its workforce of about 3,500 employees, and he’d like to leave some spots open in case the Board does indeed pursue layoffs. “We want to keep some positions vacant for some employees who might be affected by any reduction in force,” Schwartz said. The county is indeed projecting that Amazon won’t generate substantial new tax revenues for several years yet, leaving Arlington officials with some lean budgets in the meantime. Schwartz projects that new expenses associated with the statewide Medicaid expansion, to the tune of about $1.2 million a year, and rising costs to fund Metro service, with expenses nearing an additional $10 million this year, will put a particular strain on county coffers. “This is just a different situation than the county has faced before,” Garvey said. Schwartz is set to present his first budget proposal to the Board in February.